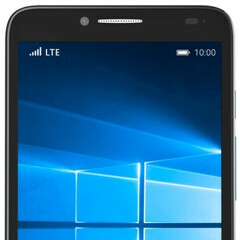 T-Mobile is reportedly getting ready to launch its very first Windows 10 smartphone: the Alcatel OneTouch Fierce XL (initially announced in January at CES 2016). According to Windows Central, T-Mobile should start selling the Alcatel OneTouch Fierce XL this Wednesday, on February 10. The phone's price is expected to be of $139 (no contract required), so you've probably already guessed that we're not talking about a high-end device here. The OneTouch Fierce XL sports a 5.5-inch display with 720 x 1280 pixels and 267 ppi - certainly not the sharpest 5.5-inch screen around. The handset is powered by a quad-core 1.1 GHz Qualcomm Snapdragon 210 processor - a low-end chipset, but Windows 10 should still provide a decent user experience on the device, especially since there's also 2 GB of RAM on board. Other notable features include LTE, 16 GB of expandable storage space, and a 2500 mAh battery. Our Alcatel OneTouch Fierce XL hands-on will let you know more about the new smartphone. The Windows 10-based Alcatel OneTouch Fierce XL is named just like the Android-based OneTouch Fierce XL that MetroPCS released in November. The two phones also share most of their specs and features (minus their OSes, of course). In case you're wondering, at the moment, T-Mobile doesn't sell new Windows handsets at all, but you can buy a certified pre-owned Microsoft Lumia 435 (which runs Windows Phone 8.1) for $49.99. Or maybe you'll go for the Alcatel OneTouch Fierce XL? Not a bad looking device. A cheaper alternative to the 640XL and with double the RAM. I wouldn't hesitate if you're a fan of Windows... I'll try it but my guess is 10 will disappoint me as much as 8. By the name it shoukd be spec monster but turns out the opposite. Why WP 10 ? Its clearly fail....... Even Nokia could help wp.! What you're saying has been said for years now. And while Android continues to thrive and dominate, Windows on mobile is all but nonexistent. Consumers have been rejecting Windows on Mobile for over a decade now. It's not going to change. Symbian failed because of Nokia's leadership. They refused to change with the times. And when they finally decided to, it was far too late. Then of course, Microsoft got their claws in them and it was over. None of those scenarios are happening or would hppen with Android though. Google is too smart for that. Like I said, Windows on Mobile was being rejected for over a decade. No one wants it. It's not even that potent in Enterprise. And with Microsoft borderline sabatoging it's own Lumia line the writing is all over the wall. Actually no and yes. They tried to get Symbian open sourced, tried to license it out. Other OEMs did not like the control Nokia wanted. Had nothing to do with change and times. Symbian failed because no one jumped on board. Leaving Nokia with millions and millions of funding gone, a black hole that android may have saved, but had no cash to dive into it. MS came in rest is history. And yes they went with android idea FIRST before MS. Windows has not been rejected for a decade. What has happened is carriers and salespeople have rejected it. As a result apps have not come quickly or at all in some areas. When you got to a carrier and they flat out lie about windows devices...yes I have caught them red handed doing this, this is what has hurt them the MOST. As a result, no share, no users, no love from anywhere else. I rarely met anyone back in the day of android 2.3 and win7 that hated win7. When apps failed to come and devices failed to come...that's when they left. Key word being "you". Aside from the Shadow days and Windows Mobile, consumers have largely ran from it. Mediocre devices(aside from the camera on some)and half baked software will do that. I don't know anyone aside from myself and MeanestGenius who were carrying the Windows torch. Both of us have up on it. Well... MG still holds out hope but the writing is on the wall. Consumers have rejected it lsrgely. As have carriers and OEM's. These are all facts. Had Nokia totally redone Symbian from the ground up when the iPhone first launched, they would still be in the handset business today. Instead, they chose to take the money and that got them nowhere. Unfortunately, we're in an app driven world. Microsoft had more than enough time, influence and money to get developers onboard. They dropped the ball there. And like I said previously, the OS was also rejected. If MSFT really wanted to be a phone player, they would pay major developers to create WP versions of popular software. My wife uses WP and it's frankly impressive. But what keeps me from jumping is that I need certain apps offered on Android & not available on WP. This is nothing new, but needs to be said. It shows that MSFT is not really interested in being a serious player in the mobile phone market. I imagine they think their connection to the enterprise market will save them. Don't think so. Too bad the one item original to MSFT is so poorly supported. They would have to pony up BILLIONS for developers to put out the number of apps that are sorely missing to drum up market share. Since I don't see that happening it will continue to be a vicious cycle. Those that try the platform will like it but hate the app support and revert back to their prior platform. PART of the problem MOST don't realize is many many apps arent even apps, they are HTML5 websites wrapped in a button with a autologin ability. It wouldnt take much to do that for most. Its annoying. Useful apps such as my online banking are not simply HTML5 websites. I cannot make mobile deposits on Windows Phone. That alone is a deal breaker. Mobile deposits is the only thing that bank apps offer, I have no need so for right now it doesn't hurt. Everything I do is website friendly. However this is no way saying we don't need it. We certainly do. But just not to long ago this didn't exist, and no one was leaving android because they didn't have mobile deposit. There is a chicken and egg scenario with MS they need to find a way and break. maybe you should try a WP before you open your pie hole! Ill buy as a spare.. I like my 950XL.. but it seems buggy. Not sure its OS or build. BUt willing to find out for $189. BTW.. anyone know if it will be a web only release ( Like the M8 and the 640XL) or a store release ?